In this series of posts, we’re highlighting questions we’ve found on the public Numbas editor which do something innovative or are of particularly high quality. 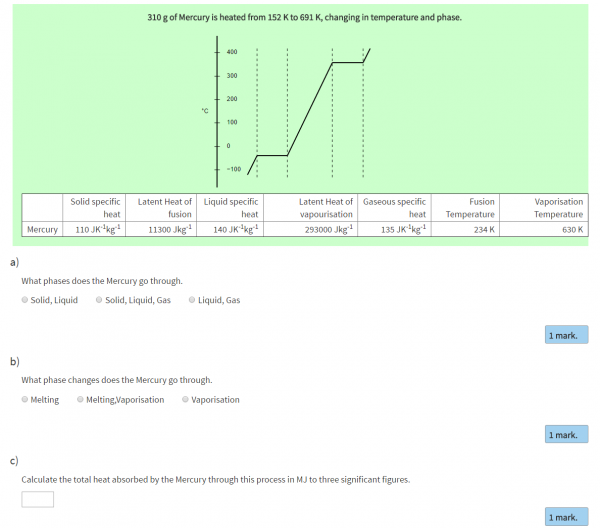 This question by Dr. Tom Stallard of the University of Leicester asks students to interpret a graph showing the temperature of a material as it is heated. The graph is dynamically generated using the JSXGraph extension, and a table shows some of the physical properties of the material. While quite a simple question pedagogically, I like how the dynamic graph in this question displays information to the student in an intuitive format. I am an Associate Professor of Planetary Astronomy at Leicester. I use Numbas for the College of Science and Engineering Foundation Year, teaching the module Heat and Energy. I use Numbas both as a teaching aid, providing randomised questions at the end of each lecture that the students can use to practice with as the course continues, as well as a form of continuous assessment, with a set of randomised questions every two weeks that the students can re-take to a passing grade. Because the students use these questions extensively, I make sure to include a broader range of randomisation, so that not only the specific numbers, but the aims and content of the questions can change each time the question is asked. Thanks to Tom for releasing this question under a CC-BY licence, so others can reuse this question freely! Try this question now, on the Numbas editor, or have a look at the rest of Tom’s freely-available content. 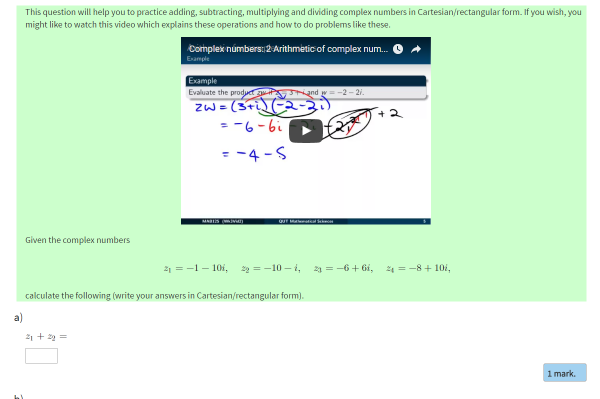 In this question, Dann Mallet of QUT very effectively integrates a video from his course to remind students of the rules of complex arithmetic before testing them on some basic operations. It’s really easy to include a video in a Numbas question – Dann has uploaded his recording to YouTube, then embedded it in his question statement using the “embed video” button in the editor (there’s a screencast in the online Numbas docs showing exactly how). I’m the Director of Learning and Teaching for Mathematical Sciences at Queensland University of Technology (Brisbane Australia), as well as teaching students of mathematics, engineering, science and education degrees. Part of my directorial responsibilities is knowing about, testing and encouraging others to use innovative technologies for teaching mathematics. This is how I got onto using Numbas – I’m working to push us from a reliance on WeBWorK to Numbas, which I find to be more friendly to “creative” teachers. So far, I’ve only managed to play around with numbers to give my students some outside of class time activities to work on. And thanks to Dann for releasing this question under a CC-BY-NC-SA licence, so others can reuse this question freely! Try this question out now, on the Numbas editor, or have a look at the rest of Dann’s freely-available content. In this question, Ben Brawn of the University of Newcastle, Australia (our namesake down under!) 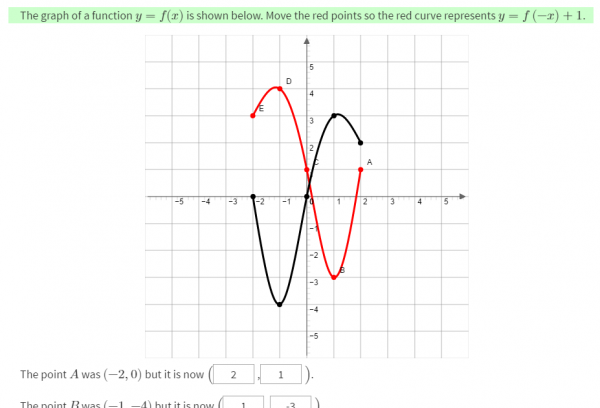 tests your understanding of plane transformations by asking you to move points on a function’s curve corresponding to a given transformation. I like how this question encourages students to explore their understanding of plane transformations graphically, by dragging points about. They can also work the other way, writing coordinates in the boxes and seeing how that affects the graph. There’s extra information under the “Show steps” button, making great use of the conditional visibility feature to show hints relevant to the particular transformation shown. I work at the University of Newcastle, Australia in the Centre for Teaching and Learning as a Mathematics Learning Adviser. The select few of us with this title, work with students individually (through a booking system and regular drop in sessions) and in groups (through regular workshops) to help them make sense of mathematical content. We advise students on how to study for courses that involve mathematics, help them see the big picture in their courses and create mathematical learning resources that we feel are useful for students. We also try to work with lecturers to improve courses if we identify issues. I create practice examples on basic maths topics (eg primary/high school) and share them on a Blackboard site that all the students at our university have access to. This way regardless of what degree they are studying they have access to basic maths practice and help. If they can’t follow the explanations given in the Numbas practice exams then they contact us for further help, either through email, video chat, or in person. I have also created course specific questions and exams at the request of lecturers that are placed on their own blackboard course sites and these have only ever been used for practice without marks attached. But who knows, maybe one day we will use Numbas for assessment with marks attached. Ben has produced a huge amount of high-quality questions on basic maths topics, with over 150 released under a CC-BY-NC-SA licence, free for anyone to re-use. Thanks, Ben! Try this question out now on the Numbas editor, or have a look at Ben’s other freely-available content.